Part 2: One of the biggest eye-sore of this development is the placement of the common rubbish bins: common & recycle. Secondary stacks also involved are e.g. 239, 249, 255, 257, 261 & 263 to name a few. Obviously, in the near future, one may have to expect lower Re-sale values or “Low-balled” to sell cheaper. 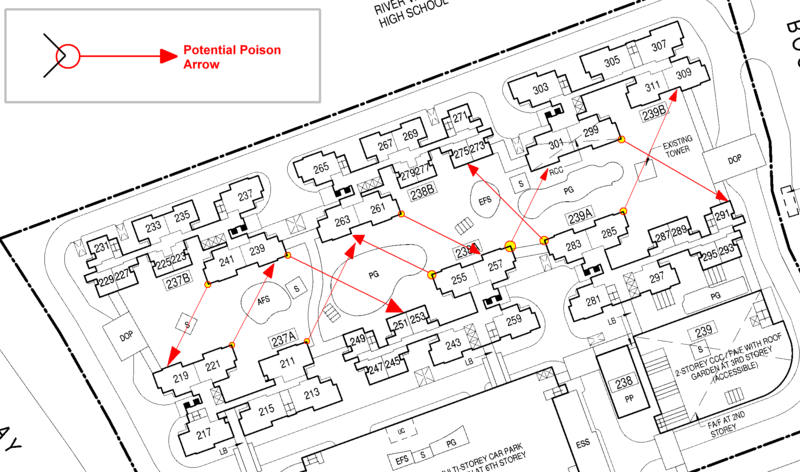 Part 3: Potential poison arrow(s) aimed towards a unit's frontage. 1. Best to assess the situation on-site. 1.1 By standing inside the specific unit's opening e.g. windows looking out to confirm whether the sharp corner of the neighbouring is a poison arrow or not. 1. Good news is that only low floors of stack 281 has a view into the PP. 2. 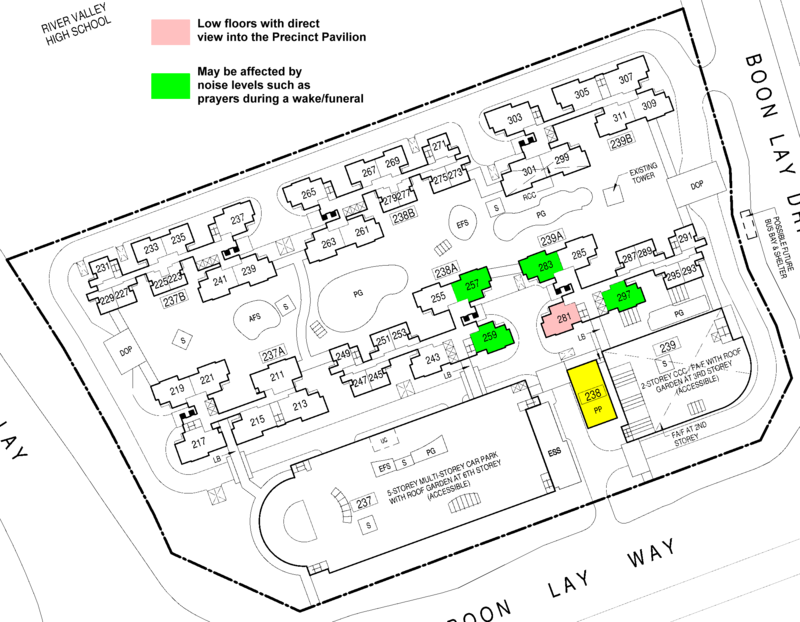 Highlighted in green: Other than stack 259 where the bedrooms may have a view into the PP, the rest are more at the mercy of "noise" (if any) during wakes/funerals if religious rites are performed. 1. There is always a stigma (or generally called Grandma tale) attached by some persons on a home near to an ESS. 2. There are also a smaller group who says that it is also a taboo to have a view of an ESS. Fortunately, most of these persons are friends of the Institute of Mental Health (IMH) or a patient there. 3. Frankly, there is no known concern of health issues associated with staying above or beside an ESS. 4. 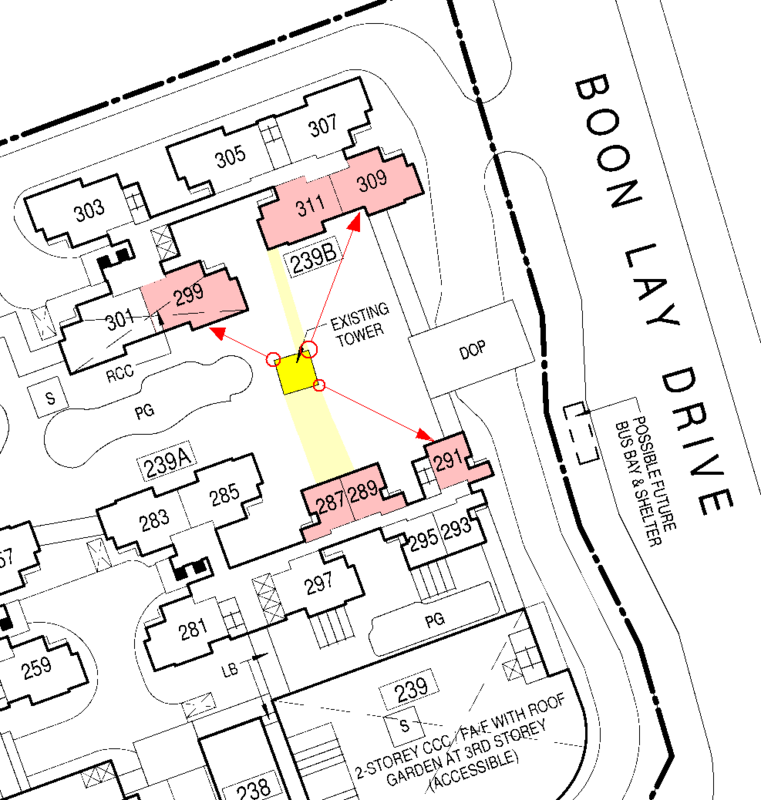 In Boon Lay Glade, the ESS is tucked away at the side of the MSCP. So much so that if one does not actively look for it; one would not think twice of it. 5. Thus although low floor stacks 250 and 281 has the view of the ESS; seriously, these stacks are a distance away from it. And, in a future resale, the ESS should never be a topic to bring up to supress the resale value (if any) especially for higher floor units. Part 6: When purchasing a unit in this development, do take into consideration the existing tower especially for low floors near-by to it. 1. 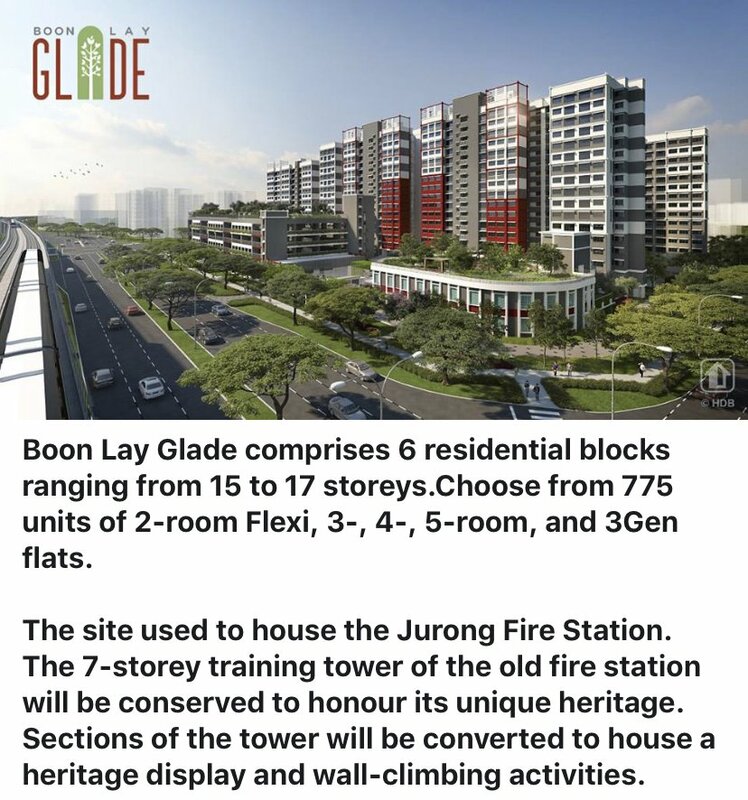 Without a doubt many would automatically add this as one of the checklist when considering the purchase of a unit at HDB Boon Lay Glade. 2. Good news is that today, somehow the modern MRT trains are less noisy. 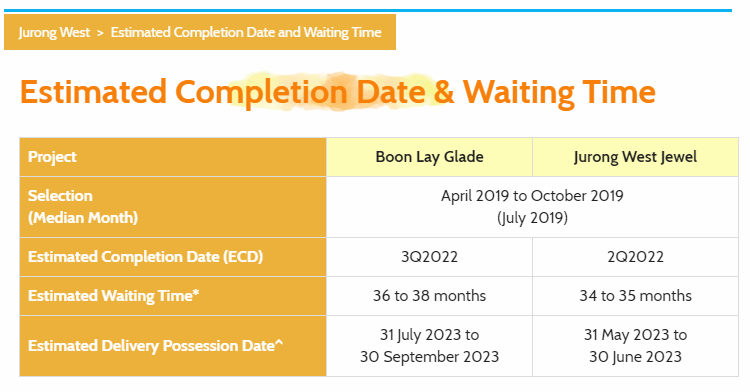 And or there is an additional add-on barrier to further reduce the noise decibel; this is good news for Boon Lay Glade BTO. 2.1 Often the loudest part of the MRT tracks is in close proximity to the MRT station. 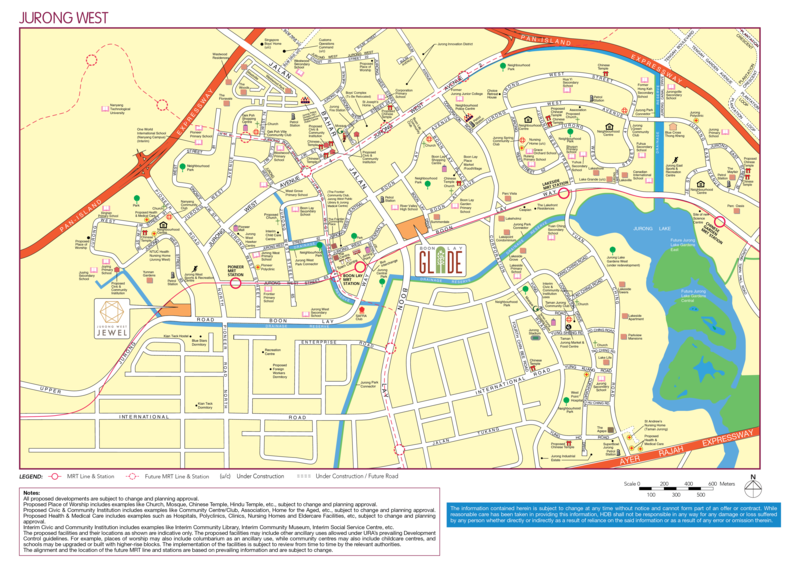 Here, trains from both directions need to start braking close to say the Boon Lay MRT station or further away is the Lakeside MRT station. 2.2. The planners of this development did a good job as it has placed the MSCP and 2-storey CCC / garden as a sandwich between the MRT tracks and the linear blocks. Far better than several condos already in existence such as Parc Vista, Lakefront Residences, Caspian, Lakeholmz. 3. Given that the blocks/stacks are set-back quite a distance away from the MRT tracks; plus nowadays MRT trains are less noisy. This should not be a top consideration. 4. In fact, with existing industry, the good news is high-floors of the South-East facing stacks/units get unobstructed views! 5. 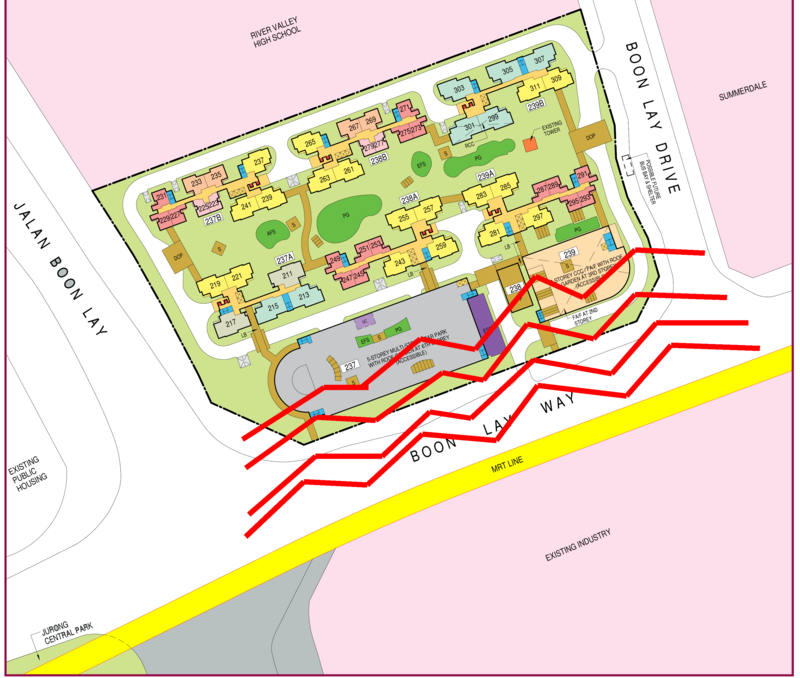 In conclusion, this is an existing MRT track and parallel to the HDB Boon Lay Glade BTO. 6.1. Previously I had a client who had just received their keys for Block 776 Waterfront Key condo at Bedok Reservoir (Circled in red). 6.2. So happen that her unit faces a "deep hole" which today is Downtown Line 30 = Bedok Reservoir station. 6.3. She had moved in and living in low floors = had to endure close to 24 hours of construction noise. 6.3.1 As unlike a residential home which has restrictions on the day and timing of renovation works; this one does not have. Therefore, it can be a Saturday or Sunday or just any weekday and construction noise can occur virtually 24 hours. 6.3.2 Indirectly this is not Feng Shui. But rather noise pollution. And it affects people living close to it. 6.3.2 Fortunately, once the MRT station was operational, this is no longer an issue. 7.1. 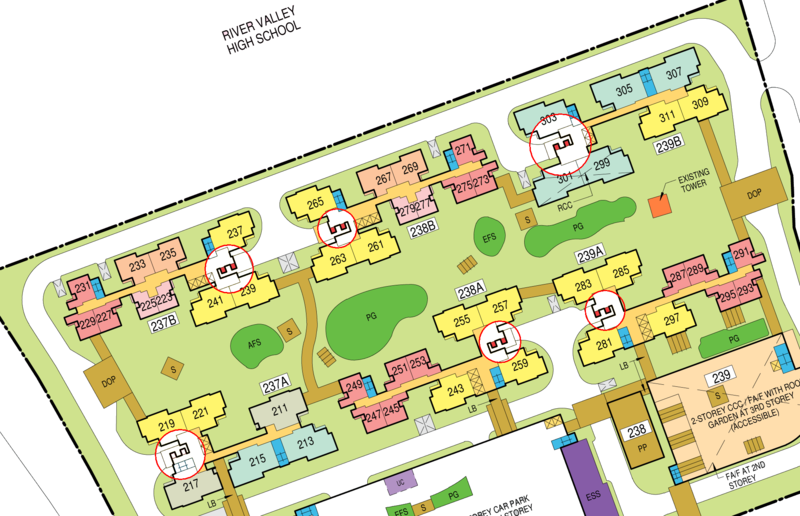 I recall in the last 28 months, I had two separate calls for Feng Shui SOS at The Belvedere. 7.2. 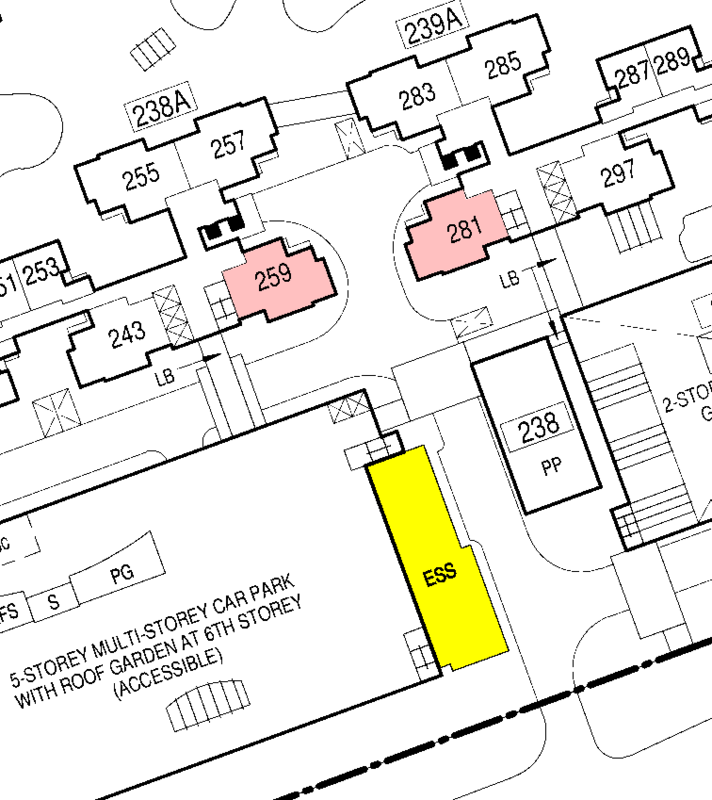 So happens that two separate families were staying at Block 53 Meyer Road and both faced financial issues. 7.3 As I understand the tunnelling works was ongoing just a few metres away and even if the tunnelling is deep down, somehow it must have disturbed the qi of Block 53. 7.4. Perhaps, it has disturbed the signature wavelength of Block 53. 7.5 From the clients balcony, I can look down towards a "hole". This hole is the proposed Katong Park MRT station. 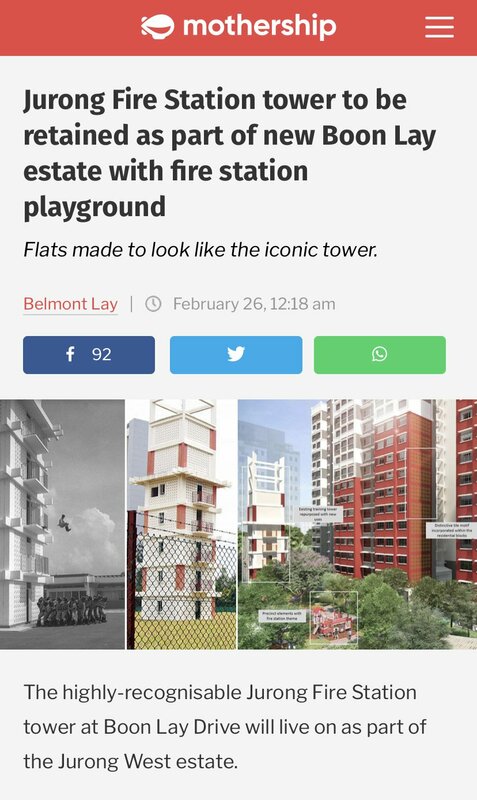 2017, Jurong Fire Station demolished leaving only a tower to remember it by. 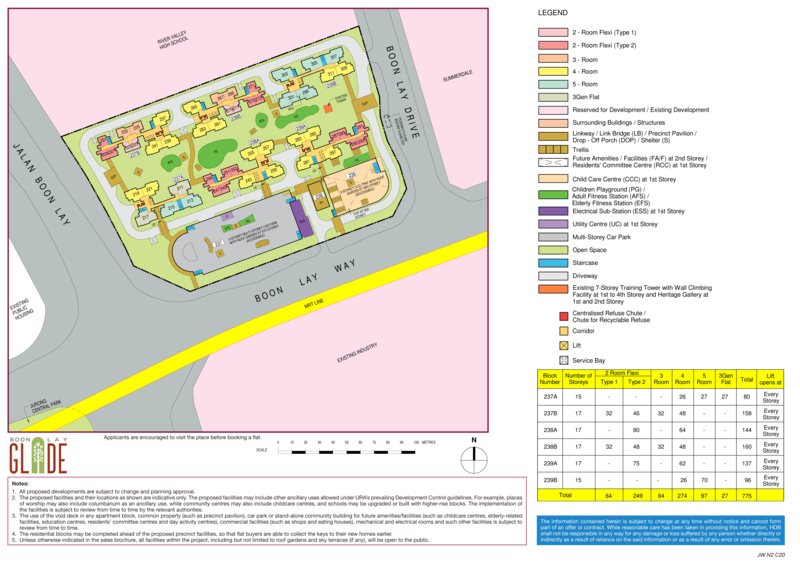 Little wonder that Boon Lay Glade BTO Site map highlights an existing tower! Above: The existing tower was part of the former Jurong Fire Station. Something to remember it by. 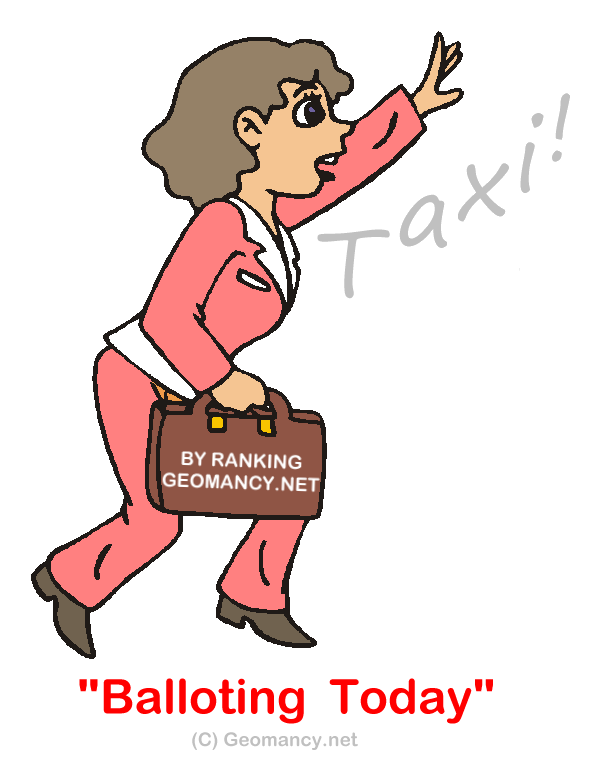 If your visitor hails a cab to your new home. And if the cabby is an elder; perhaps, tell him/her ... “Bring me to the former Jurong Fire Station!” Just no ERP, no auto-lock and no kidnap! Part 9: Should I be concerned about a row of lifts x 3 along the entire length sharing the same wall as my living room side-wall? 1. Frankly, not many Feng Shui Masters (FSM) or individuals have a keen eye on such details. 2. However, if one starts to recognise this and asks some FSM, conservatively, majority will say that it is no good. Given that there is "moving" metal beside the unit. Often also when one asks any individual; some would automatically say.. "No good!". 3. In theory, a home sharing the same wall as a "shaft" is technically one of the strongest areas in a block. And often, the lift shafts x 3 would be solidly built. A plus in the event of a once in a billion chance of such a building collapsing in a HDB development! 3.1. And furthermore, it is not like each of the three lifts are brushing themselves or rubbing their cages / wires against a wall. If so, what is your concern if one were to purchase either stack/unit #243 or #297? 4. If one is unsure or still confused or suddenly gets cold feet after hearing this point.. then, better stay clear of these two stacks/units, LAH!. Else, if really own such a unit: "GO FORTH.. and BOLDLY announce to the world that you stay in an extra safe unit!" And also proudly hang a sign that says... "THIS UNIT IS SAFE FROM BUNKER BUSTING BOMBS!" LOL! Part 10: Should I be concerned with a unit's living room wall sharing the same wall as the (emergency) stair-case? 1. In my opinon, many of us have totally no concerns or issues with this. 1.1. In fact, some of us are happy with it. As they have more privacy vs their unit sharing the same wall with another neighbour! 1.2. In addition, stair-cases are built to withstand fire-heat for a specific time plus add to the rigidity to a home "attached to" it! 2. The reason why I brought this up was because last year, a Can or cannot purchase client came to me and request that I eliminate homes like stacks 259 and 281 as she does not want to purchase a unit next to such a stair-case! 2.1. Her rationale was because she is a single mum with three daughters. Her fear (phobia) is that she was afraid of someone hiding in the staircase ... rushing out.. and... you know the rest... LOL.. Really can't blame her as she felt more vulnerable with an all girl's team. Part 11: Any good reasons to purchase a unit, here??? 1. 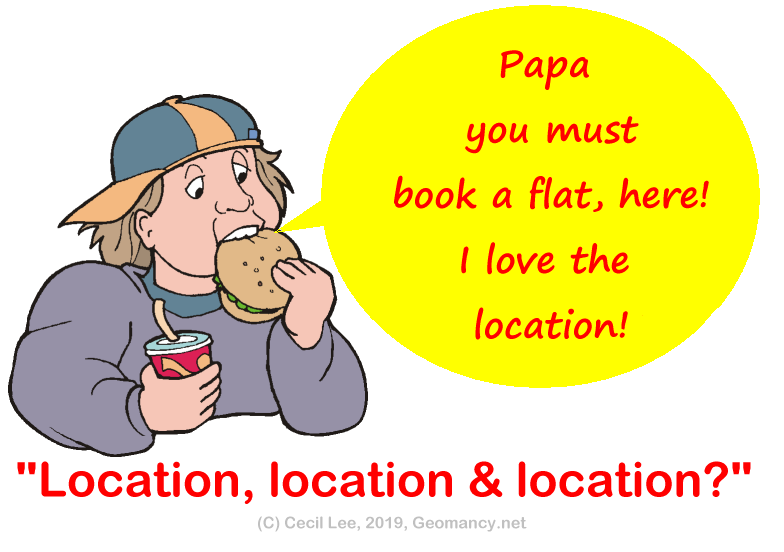 What about location, location and location? Why?? 2. Son says: "McDonalds, McDonalds and McDonalds! Please! Buy, buy, buy, here!" 2. Mummy says: "Jurong Point! Buy, buy, buy!" Still want to try your luck? Erh.... why waste your time? Please post questions that are useful to everyone. Even those who do not intend to buy a unit, here. As these questions looks into concepts, techniques or plain and simple common sense. Replies to such questions can thus be universally applied. This is how the Jurong Fire Station tower looks like, here. 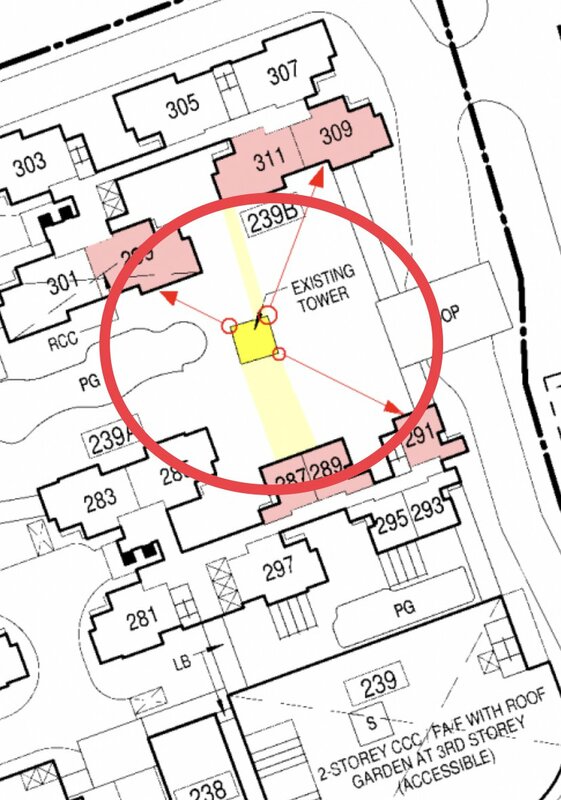 FSM says: “Oh dear, the tower has sharp corners + as high as 8 storeys high inclusive of the roof frame. World's Oldest Feng Shui Forum: Past forum messages since 1998 are still on-line. Champion of: "When the Buying Stops! The Selling Can!" 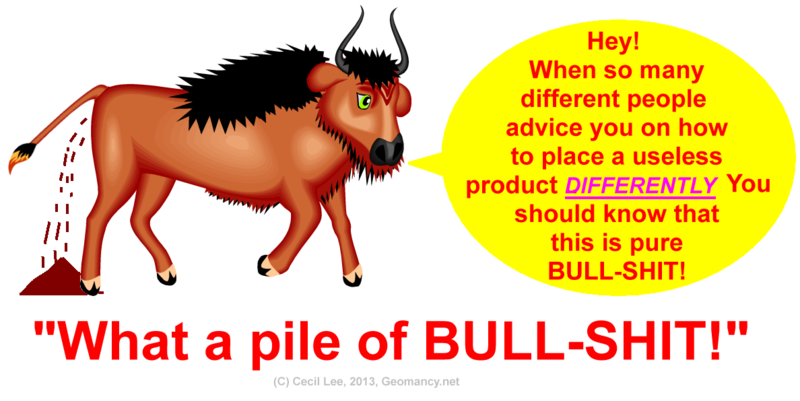 Boycott all products sold in the name of Feng Shui. Give Feng Shui a bad name. My lucky day! Oh! No wonder! RED! Cheers! Charity Begins at home. Not donate your money to those unscrupulous Feng Shui people! 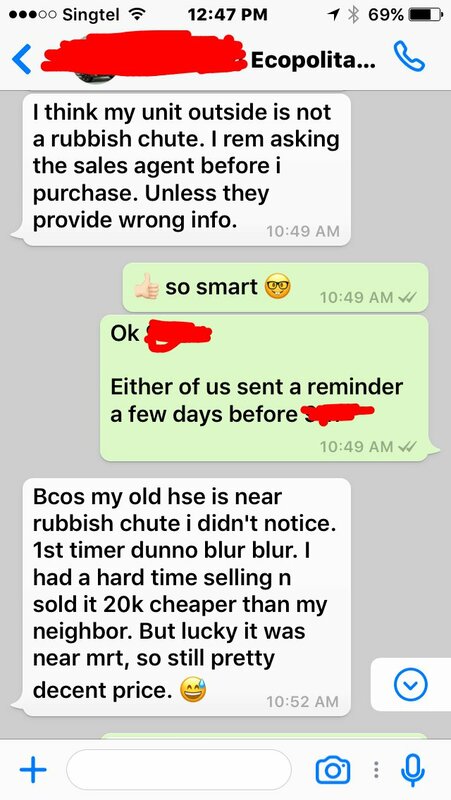 When the buying, Stops! The Selling Can! Spread the Word!